Previously, I constructed a giant hamster wheel in some bizarre ritual to help me come to terms with my life as an academic failure (for further coming to terms, please see my forthcoming novel on life-hacks). I then rolled it several miles up a giant hill, left it in a friend’s garage over and avoided making eye contact with it for the rest of the summer. Later, I destroyed it with a hacksaw and left it for dead on the side of the road. 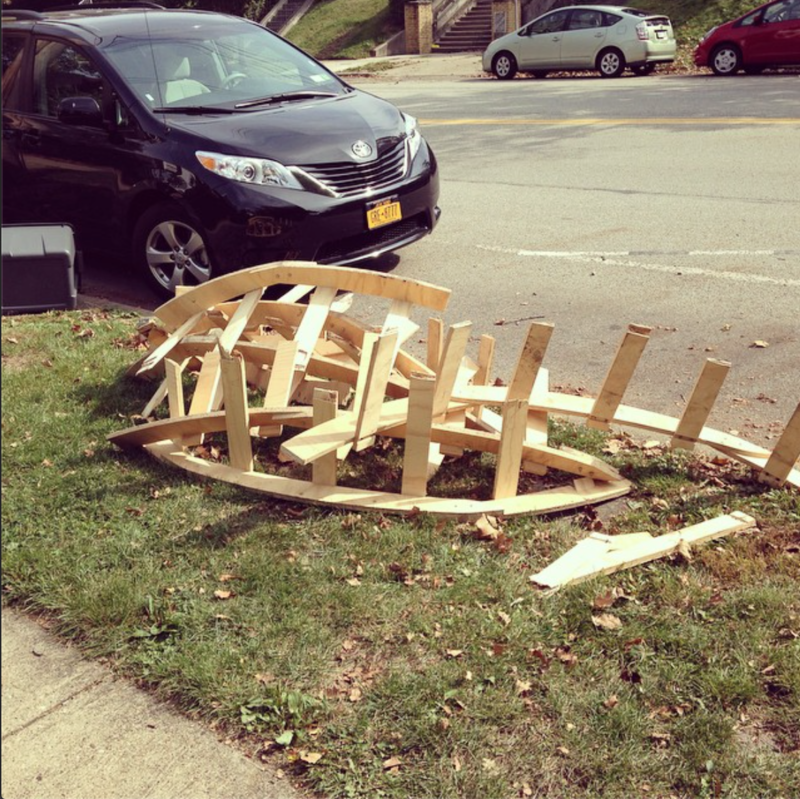 R.I.P., giant hamster wheel. 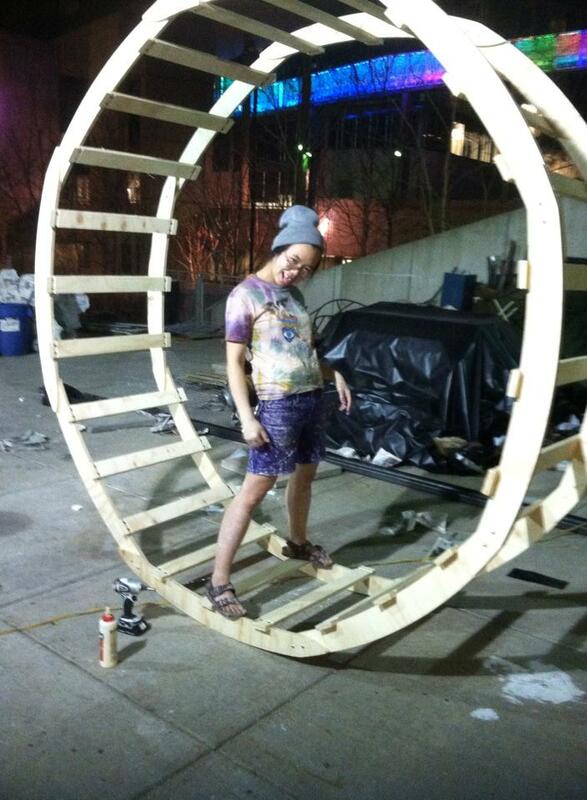 Anyways, it was determined that a giant hamster wheel constructed out of fear and shame was probably a poor choice in final project. This is so true, I totally do not recommend a giant hamster wheel built out of shame to anyone. So instead, I’m going to blog about my first semi-serious foray into Event Planning. 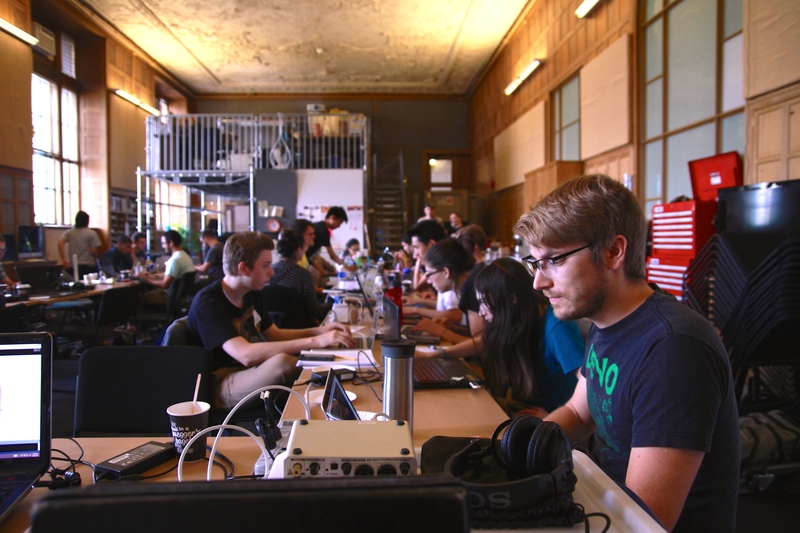 I co-organized SNAPHACK, a social media hackathon, with Miles Peyton (I know you’re all shocked and surprised @ my choice in partner). 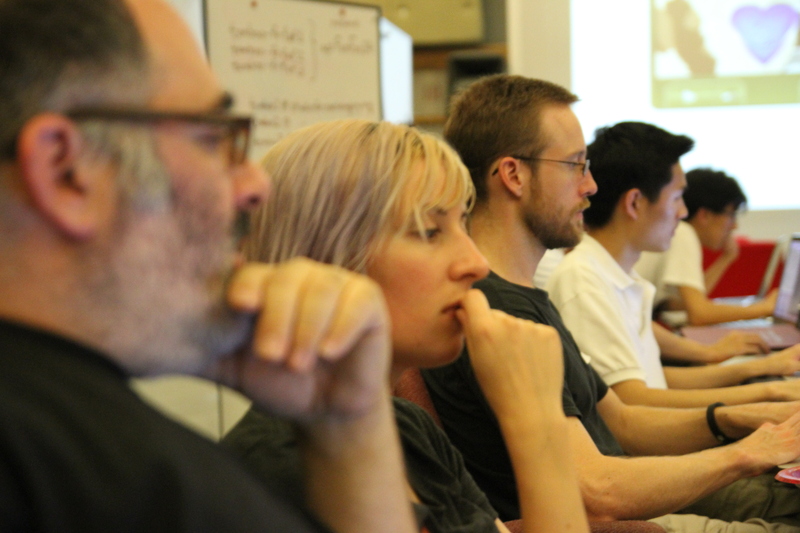 It was held on September 20th in the Frank-Ratchye STUDIO for Creative Inquiry. It was an all-day event that started at 10am and went until midnight. 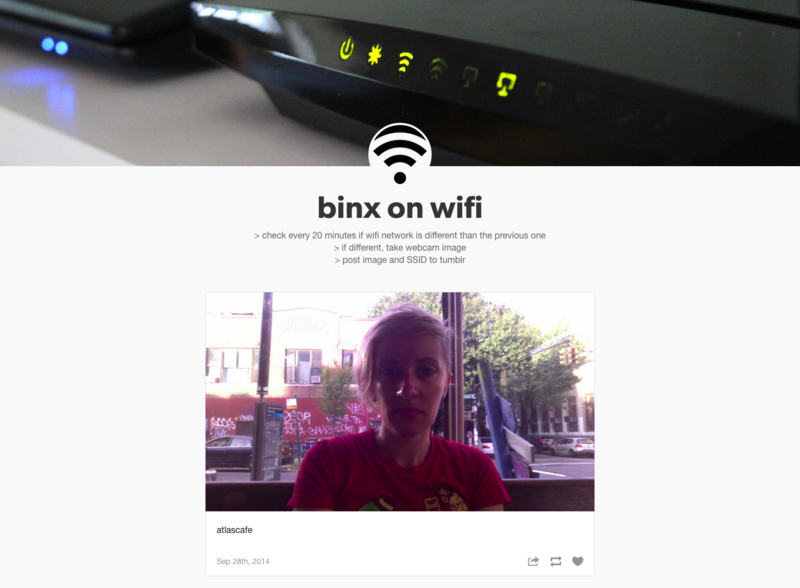 Rachel Binx’s Wifi Diary, which was “a tool for chronicling one’s movements and travels, through the lens of different wifi networks”. It’s a background script that takes a picture every time you’re in a new location, which is determined by the change in your SSID. I get a surge of nostalgia every time I have to look through my list of previously connected wifi networks, not because I actually have a fondness for “ATT_WIRELESS_798” or whatever but because I associate them with the places I travelled to, like my home in Ohio or my trip to Italy. Me and Lauren McCarthy’s sadAR: Augmented Reality for Bad Days, which was a joke-y augmented reality app that let you change the way you saw things with Instagram-y filters based on your mood. Owen Khan’s ObitCoin, a cryptocurrency where you basically just create a death pool and generate currency based on how accurate your predictions are. This is neat-o, but Owen’s worried about like, death, and won’t release the code. )-: I feel ya Owen! If anything, I learned how insanely difficult it is to organize basically anything, especially a thing where people hang out irl for a day. I think I definitely wouldn’t have ordered as much food, nor ordered super carb-y food and tried to get healthy food, like lettuce and sandwiches. Too much pizza just makes me groggy, and same w/ everyone else. I also would’ve like to have final presentations at the end. It was a really chill event which was great, because it was low-stress and friendly, but there was also no real conclusion. \-: I would’ve also tried to be more authoritarian/make loud announcements instead of awkwardly motioning people towards food whenever it arrived, but that’s generally a social anxiety issue and probably a more long-term life goal than anything. Overall though I felt it was a fun experience. It was nerve-wracking and awful to plan, and in some ways to execute, but I feel like I have maybe more of a handle on how to plan things now. I went on to plan the B☆A Presentations, a night of short undergraduate artist talks, with Caroline Record, and I thought that was pretty successful too. Maybe I will continue to plan things in the future! Who knows! It gets slightly less painful each time, which is nice. This is a kinetic sculpture by Nathaniel Mellors. It only moves, but it also makes sounds. As the audience experiences this piece, they hear words”freedom” from three heads. It is quite indistinguishable if they are serenading freedom, or asking for their freedom. Uncanny feeling comes from the object looking very realistic. The piece was displayed with a price tag with $75000. more here. This crawling robot was made by a Japanese artist to symbolize the decline of Japan’s economy. It is a robot that has a very simple mechanism, but because it has such a realistic appearance, it becomes uncanny. It not only exists as a sculpture, but it also becomes an element in public performance. This could be the future of aviation, piloting a vehicle as easy as a car. for more information on the group go here. This robot draws a portrait of a person who is sitting in front of the camera. It questions what robots can’t do and what humans can’t do. This robot draws, more accurately than an artist can. When all it does is replicate the figure in data, is it really art?